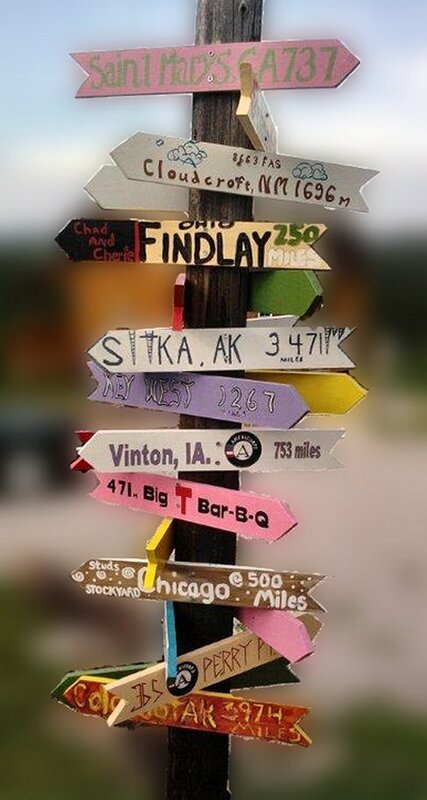 I don’t know where I’m going, but I do know where I’ve been. Leadership- It’s up to the followers. Leadership, are you a born leader? More importantly, are you a born follower. Project: Inspire People to Recycle More I Quit I don’t know where I’m going, but I do know where I’ve been. Get Connected- WVNCC Blog Leadership- It’s up to the followers. Things are easier said than done, or so the old adage goes, and we couldn’t agree more. That’s why we do The GOOD 30-Day Challenge (#30DaysofGOOD), a monthly attempt to live better. Our challenge for July? Waste less. We all know we should do it. But sometimes the convenience of tossing a bottle into a nearby trash can beats out that little voice in our head asking us to “recycle, reduce, reuse.” As we begin our July Challenge to waste less, we’re looking for ways to make the three R’s easier to follow. Reducing the waste we create often falls to the bottom of our list of priorities, and that’s understandable. Let’s find a way to remind our community why it matters and what they can do to be part of the solution. Tell us how you think we can encourage those around us to adopt better recycling habits. Will you post a list of recyclables next to the blue bin so people know what they can put in it? Hum the Recycle Rex song until it gets stuck in your friends’ heads? Plaster Chris Jordan’s photography from the Pacific Garbage Patch all over your office? Create a data visualization or video that blows up online? Get creative and the GOOD community just might adopt your plan. Send us your plan as a photo, a video, an audio file, or a pdf by Tuesday, July 19 by submitting here. The winning entrant will be announced on GOOD.is, receive a GOOD T-shirt, and get a year’s subscription to GOOD Magazine to keep or send to a friend. Sometimes the easiest way to solve a problem is to stop participating in the problem. The smartest choice is to say “I quit”. I don’t think that quitting should be your primary method for dealing with problems. But there are certainly a lot of cases where it just seems to be the most intelligent answer. The more I stop trying to force things to happen, the more they seem to sort themselves out. 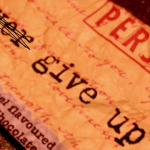 Giving up is really about honoring your feelings. It’s about giving up trying to force yourself into a mold of societal norms and embracing your true self. Quit trying to be cool. Quit keeping relationships with people you don’t really like. Give up trying to be important. Focusing on community is usually more fulfilling. Quit trying to be super-focused. Sometimes the most compelling ideas come from the most messy, unexpected sources. Quit trying to be everything to everyone. Quit thinking that you don’t have the time or skills to make your dreams a reality. Trying to make things happen all the time creates a lot of unnecessary anxiety. When I give up, I accept life as it is. No strings attached. No wishing things were different. If an action needs to be taken, I take it. But I’ve given up letting my happiness be dependent on a thing. Most of these problems only exist within our minds. They’re not problems; they’re simply unnecessary goals. 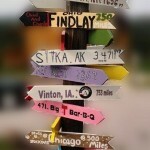 It’s interesting how we seem to have so many problems, so many dilemmas. But most of the time the answer to solving them is doing nothing. So, what do you think? 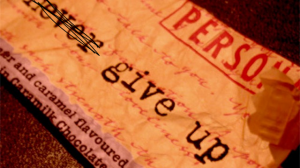 Has quitting ever helped you win? Get Connected – Everyone’s doing it! When people think of social media, they usually think of sites such as Myspace, Facebook, and Twitter. Most people do not take social media and these sites too seriously; they think of them as a way to connect with family and friends or as a way to kill boredom while browsing the internet. This is really no longer the case. 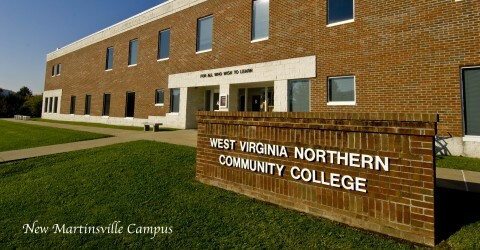 West Virginia Northern’s New Martinsville campus realizes this and is finding new ways to connect with students using these tools, whether it is by alerting students of important information such as class or campus cancellations through Twitter and text messaging or whether it is by telling the students about important campus events through this blog. Students will learn the importance that social media tools can have when it comes to spreading the word about businesses. And although students will be using and discussing popular sites such as Facebook, Twitter, and MySpace, one other site that will be discussed and used in the course is Linked-In. Linked-In is a business/career oriented site for people who want to learn and make connections. Users are able to join groups and connect with former colleagues and classmates. 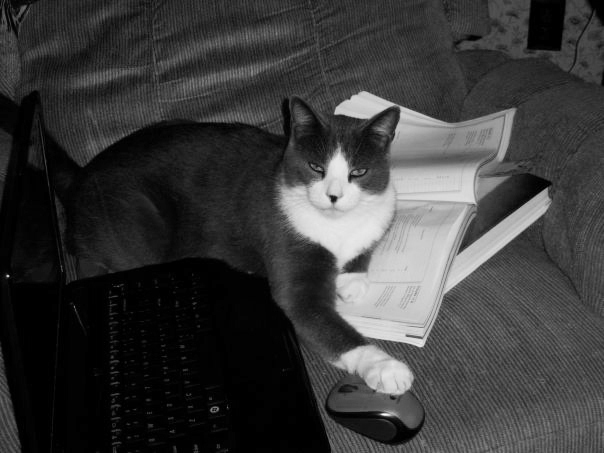 Another surprising aspect of Myslinksy’s course is the blog that is used for the course. Students will be accessing a WordPress blog on the web at http://smwtwvncc2011s.wordpress.com Here, students will find general course information, the syllabus, assignments, required text readings, and other important information about the course. Doesn’t take long- once you get started. I bought a piece of property several years ago located in the Wayne National Forrest, close to Fly, OH. We were going to sell the family home in New Martinsville and build a log cabin in Ohio. Well the economy went “south” and the price of logs went “north” and that was the end of that idea. 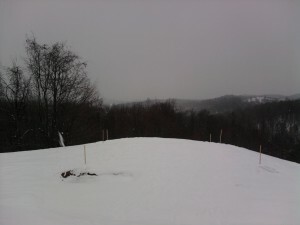 I spent two years looking at my stakes in the ground with no progress in site. 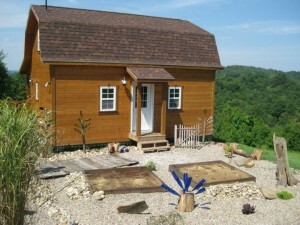 After deciding a house wasn’t going to happen the plans were downsized and we started looking at small cabins. Most of them were of the roll off type. Factory built, trucked to the site and dumped on the ground. Many were well-built, but since they were designed for truck delivery, they were only 14 feet wide and 36 to 42 feet long.. Not really the shape that’s comes to mind when I would think of a cabin. I moved the stakes but again the project ground to a halt. If you think the post is moving slowly, imagine how we felt. On December 27th, 2009 we discovered Weaver Barns, in Sugar Creek, Oh. Yes, just like it sounds, Weaver specializes in building barns and yard sheds and on occasion a cabin. We were so impressed with their quality that we signed a contract on December 31st. After factory building the walls, the cabin exterior was completed in one and 1/2 days. They didn’t work as fast as my time-lapse video but they were amazing. Needless to say, those men know how to work. In case you couldn’t count there were six. We roughed in the electric and plumbing, Weaver came back and finished the interior, we did a little exterior decorating and what you see below was completed by July 31st. So even though it was three years coming, once we focused on the Dream, and we added some Weaver, it took just a little time. During the Holiday Season we are overwhelmed with special, once a year treats. My sister’s Red Velvet Cake, my wife Fran’s Nut Roll, Susan’s Candied Spice Pecans are just a few. There’s peppermint candy here, chocolate toffee there. Everywhere you look, special treats. Sugar, sugar, and more sugar. Sometime during the Holidays sugar overload kicks in. Give me an apple, pear, or a head of lettuce, anything but sugar. 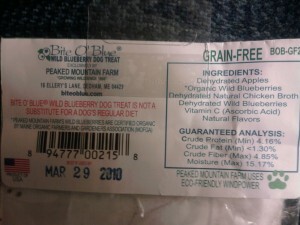 Ah, there on the end table, I’m not wearing my glasses, but I see on the label,“Bite O ‘Blue, Get Real, Get Maine“. 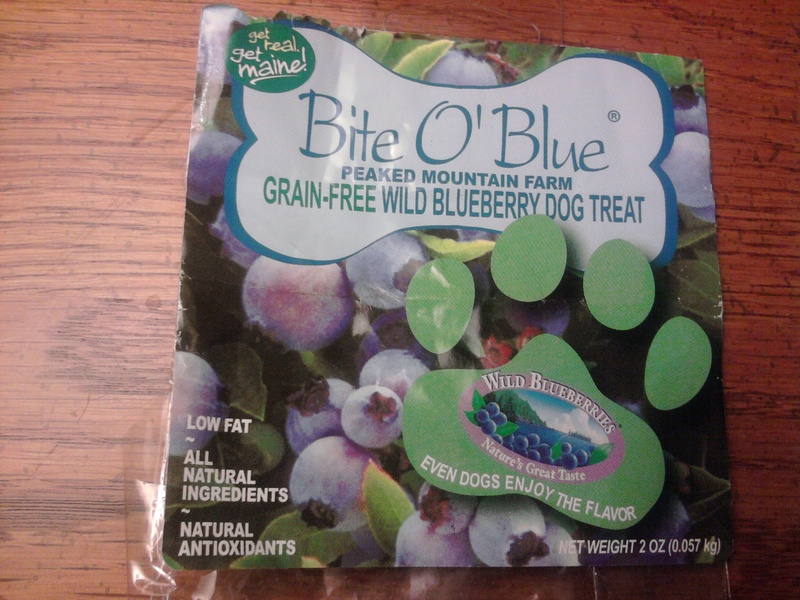 I squint to see the ingredients; dehydrated apples, “organic” wild blueberries, vitamin C, natural flavors, all in small treats without sugar. My caving will be fulfilled! 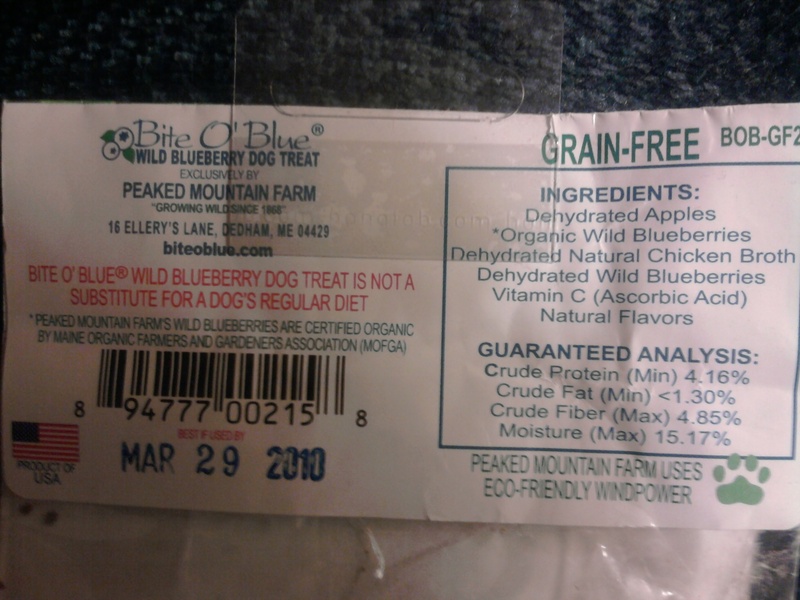 They tasted like blueberries, a little dry, but the package was left open so I gave that no thought, ate a few and moved on. Over the next week I ate all most all of them. New Years had come and gone and it was time to take down the tree and cleanup the living room. There on table were the last of the blueberry treats. I though I should offer some to Fran before eating the last few. Did she want some? She said no, but our dog Hersey might, after all she said, they were Dog Treats. DOG TREATS! The paw on the package should have given it away.No problem, I felt great, hadn’t gotten sick and I was happy that the fruits, and oh, the Dehydrated Natural Chicken Broth, all came from the USA. (Hershey doesn’t like Chinese Food) .Now I just wish I would stop trying to scratch my ear with my toes. 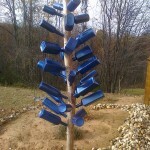 My first experience with Bottle Trees was at Quigley Castle in Eurica Springs, AR. The “one of a kind” house was built in the 1940’s with stones collected by Elise Quigley and gardens contain many decorations made from glass bottles. 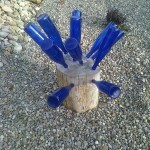 It was then that I decided that bottle trees would be included in any future landscape project. The roots of the Bottle Tree are in the middle of 9th century Africa…the Congo.In Africa, the Congo Tree Altar is a tradition of honoring deceased relatives with graveside memorials. The grieving family would surround the grave with plates which were leaned against the grave or hung from nearby trees. The plates were thought to resemble mushrooms, the Congo word for “mushroom” is similar to their word “to love”. 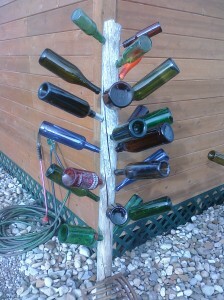 Traditions follow people and the bottle tree tradition was brought to this country by Africans.As the stories were passed from generation to generation, the tradition changed. In one variation of the belief, bottles were hung from trees by strings, in hopes that any devilish spirits lurking near the house would be attracted to the colorful bottles shining in the dusk. The spirits would become mesmerized by the play of the sunlight through the colors of the glass, and become trapped inside the bottles which were periodically corked and thrown into the river to wash away the unwanted spirits. In another variation of this theme, the spirits are also trapped in the bottles, but are said to be destroyed when the sun comes out the next morning. 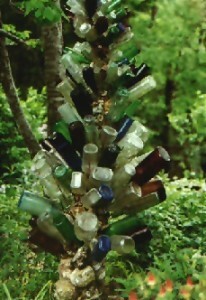 Sometimes the bottles were hung in trees by strings, but usually they were put on the tips of the tree. Cedar trees were most-often used since their up-turned branches pointed heaven-ward and were just right for the placement of the bottles. Although bottles of many colors were used, blue was thought to be an especially potent spirit repellant. This is why you can still find homes in the south with blue-painted doors and window frames. It was thought blue, the color of sky and water, has the power to repel or overcome evil. Blue is also the color of dreams, spirituality, of distance, and the heavenly realm. Whatever color bottle was used, it was the bright colors of the bottle trees which were used to attract and trap the spirits. of the trapped spirits whistling on the breeze.